For areas where there is no local chapter we seek volunteers to develop an organization committee to petition the IIC Board for permission to start a local chapter. The Institute for Internal Controls, Inc. (hereon referred to as TheIIC) is looking for Instructors/Developers of training courses that will be attended by associate members preparing for the CICA and CCS exams, as well as for CPE credit by certified members and non-members. Experienced instructors who desire to teach for TheIIC, but who require all subject matter to be provided to them. Experienced instructors who desire to teach for TheIIC and are willing to develop the subject matter that they will teach. Candidates who are willing to develop course material but do not want to serve as instructors. Note that all courses must be developed in English. As a result, all course developers must be proficient in the English language, including English grammar. Note that developed courses will also be available in the international marketplace. In some instances these courses may be delivered in the native language of the country, using local instructors. All course content must be the original work of the developer or TheIIC. Course developers are responsible for ensuring that all citations and references are noted in the course materials to acknowledge the use of the "work of others”. All course descriptions and outlines will be approved by TheIIC in advance. TheIIC reserves the right to review all course material in advance. This includes PowerPoint slides, case studies, and handouts. TheIIC reserves the right to modify or suggest changes to course material based on the results of attendee feedback and evaluations. Committees will be established under the direction of the IIC Chairman to develop a library of Internal Control Questionnaires (ICQs) for use by members of TheIIC. The ICQs will be contributed by members or available at sources such as the internet or in publications (with permission for use). The committee may also organize sub-committees to develop ICQs for new areas of interest such as BYOD, use of iCloud, etc. An ICQ Committee chairperson will be appointed by the IIC Chairman to direct all activities of the sub-committees. All active arbitrary members of the committee may be awarded author CPE for application to meeting IIC CPE requirements. The purpose of the Editorial Advisory Committee is to assist the editors of TheIIC e-Newsletter and TheIIC e-Magazine meet the interest and needs of the membership and meet high professional standards. The committee shall be composed of not less than six members for each publication and may be increased as needed to meet the editor's changing requirements over time. Members of the committee shall be selected and appointed by the editor in chief of each publication with the advice and approval of the Office of the Chairman. Terms for committee members is open-ended based on the availability and contribution of the member. To establish and apply appropriate standards of professional quality for material published in each publication and formulate such editorial policies as will ensure the journal's continuing quality. Provide the editor in chief of each publication with an advisory panel of competent members to review articles and manuscripts submitted for publication. The editor and at least one committee member shall review each article submitted. Provide recommendations to the editor and staff on maintaining and improving quality of the journal product, content, and procedures to ensure proper double-blind review and control of the editorial process. Submit article ideas and occasional articles to the editor. Develop an appropriate post-publication quality assessment system for timely feedback of member and public perceptions of the magazine. **Meetings may be conducted in person or by conference call or Skype or via email exchanges. The committee chair shall give reasonable notice to all committee members of the place, day, time and purpose or purposes for any committee meeting. The Institute for Internal Controls encourages the establishment of student chapters at Universities where internal controls is part of the curriculum, whether as part of the accounting/auditing program, IT programs, or management program. The IIC will assist the student chapter in providing educational materials including speakers, video training, etc. Members of the Student Chapters will be eligible for scholarships as dedicated by the Office of the Chairman and the Student Scholarship Committee. Click to learn more about Student Membership. The purpose of the Scholarship Committee is to advise the Office of the Chairman regarding the award of scholarships. The Committee shall be composed of no fewer than three and no more than five certified members in good standing. Members of the committee shall be selected and appointed by the Chairman. Members of the Committee shall serve staggered three-year terms, with one third of the members rotating off each year. The Committee will meet at least twice a year, and may conduct additional meetings as necessary. The Committee Chair shall give reasonable notice to all Committee members of the place, day, time and purpose or purposes for any Committee meeting. Meetings may be conducted in person or by conference call or Skype or email exchanges. 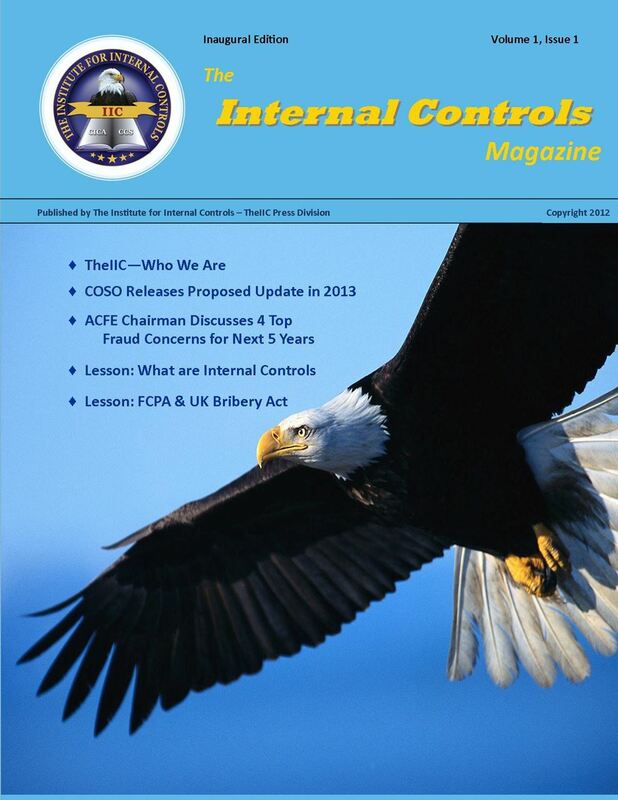 The Internal Controls Magazine is published as an online magazine by the Institute for Internal Controls (TheIIC) as a service to its members and others interested in internal controls. Articles published in The Internal Controls Magazine typically cover a variety of topics related to the audit, review and evaluation of internal controls, the monitoring of internal controls, the design and implementation of internal controls, information and network security, management, operational, financial, IT and physical and network access controls, as well as ethics and governance, legislation/regulations issues, etc. Articles published in The Internal Controls Magazine are directed at a wide range of professionals globally who have an interest in internal controls, including both internal and external auditors, accountants, consultants, fraud examiners/forensic accountants, loss prevention professionals, investigators, law enforcement officials, financial officers, IT personnel including network security professionals, systems designers and programmers, attorneys, and educators. Most readers hold the CICA or CCS certifications. All parties interested in authoring or contributing to this publication are encouraged to submit completed articles that have not been published previously by others. It is highly suggested that query letters, outlines, or summaries be submitted to determine the acceptability of any articles. Note that not all articles are accepted for publication.